What Does Your Cholesterol Ratio Say? Look at your lipid profile (cholesterol report) carefully. Have you noticed that it also mentions about the ‘Cholesterol Ratio'? We never think about it, as we don't know much about the importance of it. Cholesterol ratio can give some important information about your heart disease risk. 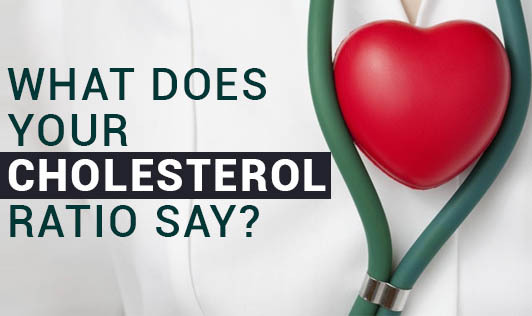 There are two types of cholesterols, good cholesterol (HDL) and bad cholesterol (LDL). The ratio is derived from the total cholesterol values and the good cholesterol (HDL) values. Ideally, cholesterol ratio for an average person above the age of 20 should be 4:1 or lower; which means if your total cholesterol is 200 mg/dL, your HDL should be 50 mg/dL. As the ratio increases, your risk for heart diseases increases. The normal values for the cholesterol ratio will vary if you have any heart related condition. So consult the Physician to know your ideal cholesterol ratio. It can be very useful to know about your heart health, and so can ring an alarm bell if there is a risk.